The lovely PurpleKecleon is at last crafting a sequel to the infamous work of classic art never been equaled since the Sistine Chapel got a new paint job: EVERY SINGLE POKÉMON. The followup is aptly titled Every Single Pokémon 2. 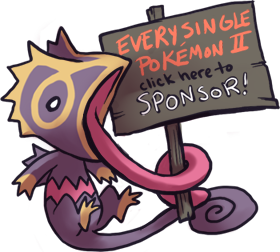 Anyway, if you fancy yourself a patron of the arts, you can chip in a few bucks to sponsor some particular Pokémon, and she'll send you a crop of them as soon as they're done—no waiting for the whole image to be finished. OK it seems I decided at some point to strip out images in posts, including for myself. What a jerk I am. Luckily I have db access. Whoops that's supposed to link to the donatey page sigh.